I-385 Rehabilitation (South Carolina) - The South Carolina DOT (SCDOT) closed 15 miles of I-385 in Laurens County in January 2010 for rehabilitation. This was the first time SCDOT implemented full road closure for a non-emergency project. Doing so allowed SCDOT to complete the project in less than eight months instead of three years if lanes were kept open and save more than $34 million. The rehabilitated stretch of I-385 officially reopened on July 23, 2010, three weeks ahead of the eight month schedule, and under budget. For resources, guidance, and tools on analyzing the impacts of road and lane closures, visit Work Zone and Traffic Analysis. Full road closure is designed to eliminate the exposure of motorists to work zones and workers to traffic by temporarily closing a facility for rehabilitation or maintenance. During full road closure, traffic is detoured, allowing workers full access to roadway facilities. It is not suitable for all construction situations. In applicable situations, use of full road closure can result in positive public sentiment, increased productivity, reduced project duration, increased safety and/or a shortened risk period, and in some cases cost savings. A full closure approach may be used for an extended period of time, on weekends or nights, or directionally on a segment of roadway. Safely Implementing Rolling Roadblocks for Short-term Highway Construction, Maintenance, and Utility Work Zones (HTML, PDF 648KB) - This Fact Sheet summarizes best practices related to rolling roadblocks for short-term road work activities requiring a short-term full closure of the roadway. Full Road Closure for Work Zone Operations - A Cross-Cutting Study (August 2003) (HTML, PDF 827KB) - Provides a summary of how DOTs in Oregon, Kentucky, Michigan, Ohio, Washington, and Delaware each used a full closure approach to conduct a road rehabilitation/reconstruction project. Full Road Closure for Work Zone Operations: A Case Study (HTML, PDF 199KB) - Reducing the Impact of Construction During the Rehabilitation of a Major Interstate Highway. Interstate 95 in Wilmington, Delaware. Full Road Closure for Work Zone Operations: A Case Study (HTML, PDF 224KB) - Accelerating Construction and Reducing Crashes During Rehabilitation of a Major Downtown Route. M-10 Lodge Freeway in Detroit, Michigan. Full Road Closure for Work Zone Operations: A Case Study (HTML, PDF 203KB) - Using Weekend Closures to Expedite Road Rehabilitation and Minimize the Impacts on Motorists and Road Builders. I-84 Banfield Freeway in Portland, Oregon. "Shorter Duration, Safer Work Zones, More Satisfied Travelers" (HTML, PDF 81KB) - Brochure on successful applications of full road closures in work zones. The South Carolina DOT (SCDOT) closed 15 miles of I-385 in Laurens County in January 2010 for rehabilitation. The project included asphalt replacement, a widening of the medians, a bridge replacement, and the raising of six more bridges. This was the first time SCDOT implemented full road closure for a non-emergency project. Doing so allowed SCDOT to complete the project in less than eight months instead of three years if lanes were kept open and save more than $34 million. The public was continuously kept informed of the project through public informational meetings, media coverage and updates, brochures at all nearby rest areas, and a regularly updated web site. The rehabilitated stretch of I-385 officially reopened on July 23, 2010, three weeks ahead of the eight month schedule, and under budget. These videos demonstrate the mobility and safety benefits that are attainable through the use of full freeway closures to allow fast track improvement or repair projects. "Amazing: The Rebuilding of the MacArthur Maze" - About the collapse and rebuilding (in only 26 days) of a key portion of the Bay Area's MacArthur Maze. "A Span in Time" - About the 2007 Labor Day weekend full closure of the Bay Bridge. In 2007, the Minnesota DOT (Mn/DOT) embarked on a five-month full closure to reconstruct a 2-mile segment of Highway 36, a high-volume, commuter-heavy roadway that passes through North St. Paul. The decision to use full closure was based on the projected savings in project time and cost, increased safety, and the results of a public survey. An analysis determined that full closure would lead to a 70% reduction in the duration of traffic impacts in comparison to a partial facility closure. A public survey and input from local businesses and residents affected by the project indicated that respondents were split 50/50 over whether to use full or partial closure. Assessing the full closure option further, Mn/DOT did a cost benefit analysis and determined that full closure would be better. Without a clear public preference, Mn/DOT decided to go with full closure. A survey after the project ended indicated that the surrounding community agreed with the use of full closure and was satisfied with the project. Because this was the largest full closure in Minnesota history, Mn/DOT funded a study by the University of Minnesota to evaluate all traffic alternatives, compare costs and benefits across alternatives, conduct market research to gauge public acceptance during and after the project, and identify lessons learned for future projects. 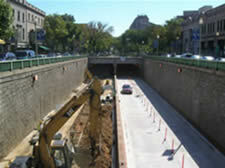 "Innovation Cuts Construction Time by a Year on Minnesota Project" - Article in May/June 2011 issue of FHWA Innovator. "A Mix of Innovations Succeeds in Minnesota" - Article in May/June 2009 issue of FHWA Public Roads. The Tennessee DOT (TDOT) closed a short section of I-40 between James White Parkway and Hall of Fame Drive from early May 2008 through early June 2009 as part of the SmartFIX40 construction project. During the closure, this segment of I-40 was widened to six through lanes and four auxiliary lanes. Work also included the construction of 13 bridges, 15 retaining walls and three noise walls. Additionally, two existing bridges were demolished, 12 side roads were completed and seven new ramps were constructed. TDOT estimated that by closing I-40 for the work, they saved motorists two to three years of construction time and frustration. With good planning and preparation and extensive public outreach, there were few problems during the 13 month closure. MaineDOT used full closure to compress three years of major rehabilitation work and associated traffic delays into two months for each direction of 24 miles of I-295. MaineDOT safety experts and traffic engineers recommended full closure as the safest and most efficient approach to the project. The $35.3 million project involved bridge and pavement rehabilitation and installation of new guard rails. The southbound portion of the project was closed from June through August 2008, while the northbound portion was closed from June through August 2009. Decreased speed limits, increased signage, additional traffic signals, and increased police presence helped ensure safety on the detour routes during the closures. MaineDOT conducted an aggressive public information campaign to ensure the public was aware of the project and alternate routes. MaineDOT collected travel count and speed data information through three locations, each with a camera, a radar unit, and a traffic count loop detector, and provided real-time traffic information via a web site that displayed a map with travel speeds, traffic volumes, delay information, and camera images. "Rehabbing Maine's I-295 Southbound" - Article in November/December 2009 issue of FHWA Public Roads. Missouri DOT (MoDOT) used full closure to complete the $535 million rebuilding of Highway 40 (Interstate 64) in St. Louis in two years, rather than the originally estimated six to eight years, and at lower cost. The five-mile western portion of the project was closed for 2008, and the east-end closure, five miles from the I-64/I-170 interchange east to Kings highway Boulevard, was closed for 2009. MoDOT established incentives for the Contractor that included timely completion and re-opening of the road, and tracking and meeting performance indicators for regional mobility. MoDOT also completed an in-depth evaluation of the impacts from and satisfaction with the closure approach. Command Center Keeps Eyes on Road - Data on Traffic Conditions Are Analyzed So Problems Can Be Fixed Quickly - Article in St. Louis Post-Dispatch, January 9, 2008. Reprinted with permission of the St. Louis Post-Dispatch, copyright 2008. The M-10 (Lodge Freeway) in Detroit was closed from February through November 2007 in order to reconstruct/rehabilitate 14 miles of pavement, repair/replace 50 bridges, upgrade utilities and replace freeway signs. "Lodge Far From a Retreat" - Article in January 2008 issue of Roads & Bridges, Volume: 46 Number: 1 that describes how the Michigan DOT saved more than $140 million, saved Detroit commuters several years of lane closures, and provided a safer environment for workers through the use of full closure on the Lodge Freeway project. Partial road closure involves the closure of one side of the freeway during reconstruction projects. Traffic is shifted to the other side of the freeway, rather than detoured, which distinguishes this type of closure from full closure. In 2002, the Pennsylvania DOT (PennDOT) began a major reconstruction project on the heavily traveled I-279 Fort Pitt Bridge and Tunnel in the city of Pittsburgh. PennDOT studied how to best complete the work and planned detour routes in the early 1980s, well before the project began and decided to perform various stages of the project separately in an effort to minimize the impact a total closure would have on the region. The last phase of the project involved closing the main span of the bridge and the tunnel and required the use of two main detour routes that already carried large volumes of traffic. With this in mind, PennDOT began reconstruction and rehabilitation work on the detour routes almost 10 years before the closures occurred. During the closures, PennDOT implemented many innovative strategies to reduce congestion and delay on the detour routes, including turning off traffic signals to create free-flow routes, expanding lane reversal hours, and opening a hole through an existing concrete barrier to prevent motorists from having to merge into a single lane when exiting a tunnel. "Holding Down the Fort", by Frank Cippel, article in December 2007 issue of Roads & Bridges, Volume: 45 Number: 12. A portion of I-710 in Long Beach was rehabilitated during eight 55-hour weekend lane closures in 2003. The I-15 Devore project involved rebuilding two concrete truck lanes in only two nine-day extended lane closures during 2004, utilizing counter-flow traffic and around-the-clock operations. "Accelerated Reconstruction of I-15 Devore Corridor" - Article in January/February 2007 issue of FHWA Public Roads. Known as Super 70, this &175M project completely rebuilt the 6-mile stretch of I-70 from I-465 on the east side of the city to downtown Indianapolis. The project occurred between June 2006 and 2008, with the bulk of interstate reconstruction and ramp and lane closures occurring between March and November 2007. To do the work in this short time frame, Indiana used partial road closures. Selected ramps and one side of the Interstate were closed at a time, with work completed on the one side in an accelerated manner before switching to the other side. There were 3 inbound lanes and 2 outbound lanes during the morning rush hour, and during evening rush hour the flow was reversed using a moveable barrier wall to add a lane in the peak travel direction. "Still Hyper Active" - Article in June 2007 issue of Roads & Bridges Magazine, Volume: 45 Number: 6. Lane Closure Policies - Provides examples of lane closure policies or strategies that State DOTs use as guidance in determining daily permitted lane closure times. Behavior Study of Merge Practices for Drivers at Work Zone Closures - Describes the findings of a study to identify which driver behaviors are the most detrimental to work zone traffic flow and safety during work zone lane closures. The report concludes with recommendations on traffic control techniques to prevent these behaviors, such as late merge to prevent queue jumpers and longitudinal rumble strips to discourage vehicles from straddling the closing and merging lanes. NCHRP Results Digest 339: Improving the Safety of Mobile Lane Closures (PDF 2MB) - Explores practices employed by transportation agencies during mobile lane closures and summarizes research carried out on different components of mobile lane closure. Improving the Safety of Moving Lane Closures (PDF 3.7MB) - Presents the results of Phase I of a study on driver behavior around moving lane closures and the effect of different components of traffic control scenarios. NCHRP Synthesis 293 - Reducing and Mitigating Impacts of Lane Occupancy During Construction and Maintenance (PDF 3MB) - Describes the current state of the practice for reducing and mitigating the impacts of lane occupancy during construction and maintenance. To view WMV files, you need the Windows Media Player.